Add a touch of fun to your bathroom decor with this 11 piece safari grand towel set from Saturday Knight Limited. This set includes two bath towels, three hand towels, and six washcloths. 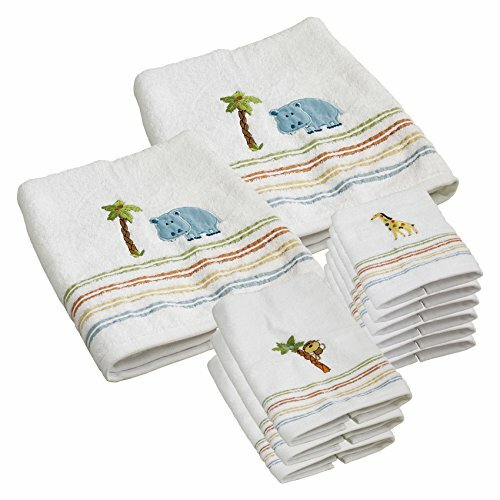 Made of 100% cotton, each towel is white with a safari design and colored stripes on the bottom border. They are also machine washable for easy cleaning. With hippos, monkeys, and giraffe, this set is ideal for a children's bathroom and will match perfectly with other safari-themed decor. View More In Bath Towels. If you have any questions about this product by Saturday Knight, contact us by completing and submitting the form below. If you are looking for a specif part number, please include it with your message. Abstract,Bath Towel,Wild Brave Tribal Animal Wolf Rainbow Colorful Backdrop Sketchy Image,Bathroom Towels,Multicolor Size: W 31.5" x L 63"
Anniutwo Safari,Hair Towel,Leopard Panther Drinking at Waterhole Wild South African Animal Documentary Print,Quick-Dry Towels,Light Brown Size: W 8" x L 23.5"
Chaneyhouse Striped,Baby Bath Towel,Turtles and Blue Stripes Abstract Print Aquatic Theme Caretta Ocean Animals Pattern,Print Wrap Towels,Blue Navy Size: W 10" x L 39.5"